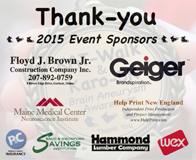 Families from Maine, New Hampshire, Boston, Philadelphia and Florida gathered on September 12, 2015 to celebrate their "Annie-versary" of survival or to remember their loved ones lost to a brain aneurysm. The new park like setting on Back Cove in Portland was perfect for the event hosting over 325 people that enjoyed a sunny day and "shared their tears, remembered with love, and walked and ran to honor." 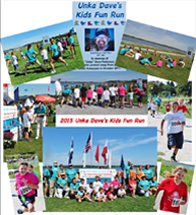 This year saw 20 BA survivors with their family and friends walk or run, the 2nd annual “Unka Dave’s Kids Fun Run” was greatly appreciated by the kids and we were treated to opening cheers preformed by the Scarborough High School Cheerleaders. 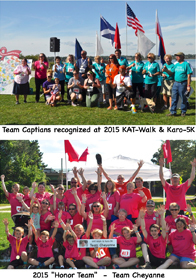 Team Cheyanne was honored as our 2015 “Team of Honor” and 14 other teams were recognized for their fundraising efforts. Information tents were presented by Maine Brain Aneurysm Awareness, Michael T. Goulet Foundation for Traumatic Brain Injury and the Maine Chapter of the Brain Injury Association of America. Among the many highlights of the day was the presentation of the “Maine’s KAT-Walk & Karo-5K Chair of Research” in the amount of $25,000 to Kimberly P. Kicielinski, MD, University of Alabama at Birmingham. Not only did Dr. “Kim” make the trip to Maine from Alabama, but she ran the Karo-5K, received honors from the assembled crowd, made a speech, and then she and her boyfriend Justin helped tear down & load the trailers and even joined us for an after-event party. 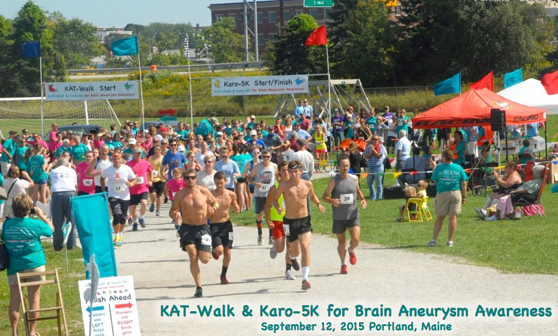 With your help, in excess of $20,000 was raised to benefit our efforts to provide brain aneurysm awareness, education, funding of research, and general support centered on the Brain Aneurysm community in Maine and northern New England. On behalf of the organizing committee and all the families affected by brain aneurysms that joined us, we thank you for your continued support and for making this a special day and a wonderful success.